Social media can be a catalyst for spreading awareness about scientific and environmental issues, and in some cases can help affect positive change. But for every link posted that actually leads to a valid, well-researched story, there are a dozen more that MIS-lead you to some nonsense article, or worse—a sensationalized, one-sided, often poorly-researched story thinly veiled as ‘scientific’. Let me disclose my own perspective from the start: I trust the evidence showing that climate change is happening, and that CO2 and methane from human-caused activity is a huge contributor. I am skeptical that corporations generally have the best interests of society or the environment at heart, and I realize that government is not always transparent or just—regardless of which party is in control. However, I am also not a conspiracy theorist, and in fact believe that conspiracy theorists tend to draw attention away from some of the most pressing issues affecting the world. While I know that human knowledge is still very limited, and our view of the universe is naturally incomplete, there are methods we can use to improve our understanding—and then of course there are methods some people use to obfuscate that understanding. As a trained scientist, I am wary of explanations that lack credible evidence (or use faulty evidence) to back them up. Each time we read a scientific story, we should be asking ourselves about the credibility of information we receive—what are the credentials and reputation of the source, what evidence does the source cite, and does the source consider multiple perspectives and valid references? As a communicator, I am particularly sensitive to journalists, writers, or bloggers who display unacknowledged bias or inaccuracy in their reporting of scientific issues. I don’t claim to know everything, nor do I endorse any particular information source; but irresponsible scientific writing ends up burning more bridges between the public and science in a time when scientific understanding is more critical than ever. Climate change denialism (like vaccination controversy) has been addressed effectively by hundreds of scientists and communicators, so I won’t spend time here discussing the ways that climate change science has been cherry-picked or misrepresented by people either not well-versed in science or actively trying to distort it. Instead, I’ll provide a few other examples of troublesome reporting. 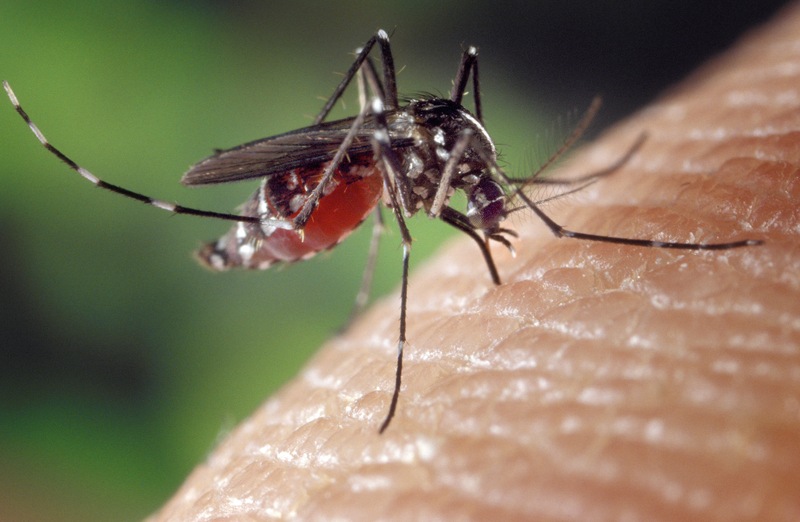 Aedes albopictus, an invasive mosquito species in Florida that can spread lethal diseases. A smaller—but no less controversial—story popping up in news media lately is the development and release of genetically modified mosquitos to help combat mosquito-borne diseases. I won’t go into the details about their development, here but you can read more about the technology by googling, or in the articles I link to below. GMOs typically refer to modified crops like soybeans and corn, but more and more research labs are toying with genetically modified insects and animals. I am wary of genetically modified crops for a number of reasons—the unscrupulous purposes of their creation, their reliance on chemical pesticides and fertilizers, and their detrimental social-economic impacts to small farmers. However, it would be unfair, and extremely ideological, for me to render every single GMO as evil without considering multiple perspectives. Even for those GMOs that I oppose, such as GM soy, I must acknowledge that we don’t fully know how harmful these crops will ultimately be to our bodies or the environment compared to conventional crops. GMOs developed by academic or independent institutions (as opposed to agro-corporations) may actually provide some human or environmental benefit that outweighs risks or harms. So what about these genetically modified mosquitos? Depending on which media source you look to, the mosquitos are either dangerous mutants who will lead the apocalypse, or they are angelic saviors in the plight against deadly disease. Of course, neither of these depictions is completely accurate, but the concept that GM mosquitos are just one more, somewhat successful but limited attempt to control vector-borne disease is not a newsworthy headline. 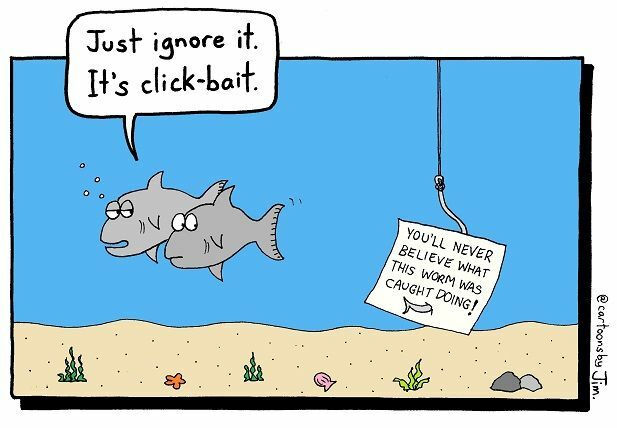 The click-bait culture has fed into sensationalized media, enticing people to click on extreme headlines that never live up to their hype when you actually read the story. It still doesn’t keep people from clicking on the links, however. And while clicking is harmless, when links begin to spread from reader to reader via social media, a highly distorted viewpoint can reach epic proportions. One such story from the site Collective Evolution talks about the potential release of GM mosquitos in Florida, arguing that these mosquitos may spread their genetically-modified DNA to humans, that their populations may eventually get out of control, and the diseases they carry are not even that dangerous or prevalent. All of these points are partially valid, but have been purposely slanted or stretched beyond scientific fact. The article does site some references, but many of them are from sources with well-known biases or controversies themselves. On the other hand, NPR published an article about the mosquitos that projects a very benign, almost positive slant, providing arguments and facts not mentioned by Collective Evolution, but also not delving into much about the risks of GMOs. On the other extreme, an author from Discovery Magazine attempts to squash all fears about the mosquitos point by point, arguing that protests against their release are ignorant fear-mongering. Another pithy author took this approach to the issue in the Washington Post. 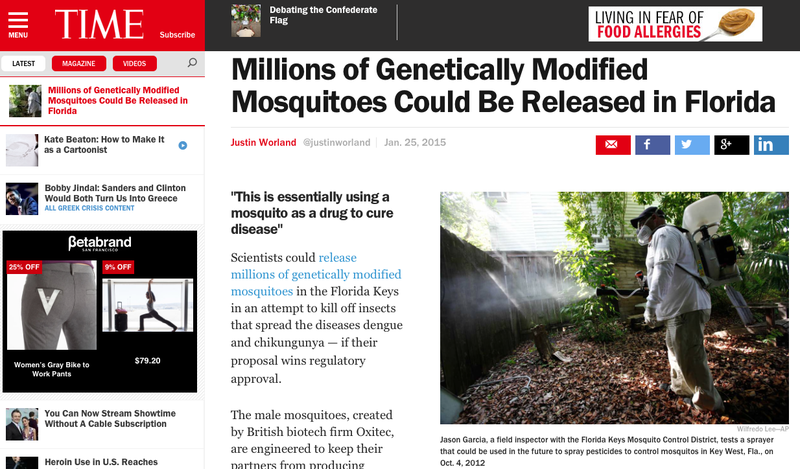 A recent article on the GM mosquitos in Time Magazine. As with any issue where science meets society, there are many nuances to the GM mosquito story, only some of which are discussed in any one news article. This is not a clear black/white, good/bad issue. The decision to release these mosquitos or not is contingent on particular societal values at a given time. Some things to consider: the mosquitos being targeted are not native to Florida, so eradicating them (or reducing their numbers) would not necessarily be a disruption to native fauna and flora. The diseases the invasive mosquitos carry, while not widespread in the U.S. at this time, are projected to increase as the climate continues to warm. The same mosquitos have been released in other cities around the world with great success, and no recorded harm, resulting in reduced rates of disease. The current method of controlling these mosquitos is with tons of pesticides—not exactly a healthy alternative. However, there have been many cases of biological releases gone wrong, so this is not a fail-safe procedure. Would you rather be exposed to pesticides or take antibiotics rather than GM mosquitos? Do you fear GM technology more than tropical diseases? How you feel about these various trade-offs will color how you interpret the issue, and the media provides additional filters. My main point is just to be aware of your own biases as you react to any scientific story—while your viewpoint may remain the same, understanding how you construct your perspective is a valuable thought-experiment that can help you build tolerance and openness to other perspectives. Our world is a mix of cultural relativism, objective external reality, and subjective reactions to that reality. Cultivating a greater awareness of what you read, and what you share with others, will help us as a society to expand our consciousness and be more thoughtful about how we co-exist in the world. I really love your topics and approach. Thank you for adding to the science-blogging community. Thanks for your comment, and taking the time to read my blog. Your kind words are much appreciated! Seriously, I ranted about click-bait a couple weeks ago. It drives me absolutely batty. Thank you. I couldn’t agree more. The sheer volume of people sharing stories without doing some investigation into sources or validity is unbelievable. Nice post, well written. Thanks again! Reblogged this on Pen Just Everything.